Property Location With a stay at Holiday Inn Express Ralston - Arena Area in Omaha, you&apos;ll be in the suburbs and minutes from Fun-Plex. 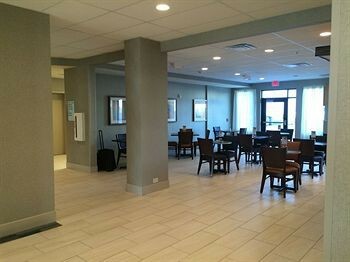 This property is within the vicinity of Omaha VA Medical Center and University of Nebraska-Omaha.Rooms Make yourself at home in one of the 84 guestrooms featuring refrigerators. Complimentary wired and wireless Internet access is available. Conveniences include phones, as well as desks and coffee/tea makers.Dining A complimentary buffet breakfast is served daily.